Have your kids already been thinking about Christmas? Mine hadn't been until the other day. We went into Walmart and after seeing the giant blow up Santa and reindeer next to the Halloween aisle Ellie said, "What is Santa doing here already?!" It seems like the stores get started earlier and earlier every year! However, planning ahead for the holidays is not always a bad thing! I'm participating every day this week in the Homeschool Review Crew's Holiday Blog Hop where I'll be talking about different ways my family prepares for the holiday season. Today's topic is: Decorating! 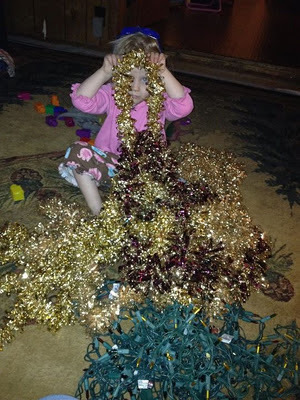 The kids and I LOVE to make decorations for pretty much every holiday, and hubby is a deal-meister who always seems to find things after the holidays on sale that we put away for the following year. Now that Halloween is over, we have a few things to take down - some posters/signs the kids made, our Halloween banner on the mantel, and some window decorations. And next we'll move on to Thanksgiving decorations. I already have a fall-themed table cloth on our dining room table that hubby picked up when he was out and about. We have a turkey garland to put up next & a few different turkey table decorations. The kids and I will also make some different decorations/crafts but I'll talk about those later on this week on the Arts & Crafts day of the Hop! We usually start our Christmas decorating the day after Thanksgiving. It might sound silly to do it so soon but it's become a tradition, pretty much since we got married. We've always liked to enjoy the tree for as long as we can. And we may *possibly* have been guilty of leaving it up longer than necessary...but we won't go into that! We have had the same tree for several years now - a fake one obviously - but have added different decorations, lights, and ornaments to it. Some year it might be neat to have a real one but fake has always worked for me. One tradition I love is that my Gramma has given us a different ornament each year since my husband and I got married. She always puts the year on it and it's something unique. I can tell that she really puts thought into it. The year we got married she gave us an ornament of two little bears bundled up in a sled with "2005" on it. The year Zeke was really into Winnie the Pooh she got him a set that had Tigger, Pooh, and Piglet all dressed up in holiday garb. Another favorite thing of mine is putting on the ornaments that the kids have made over the years - we try to make a different type each year - and the ornaments I bought with their names & birth dates on them. As they grow, they've gotten more and more into decorating and helping. The kids also each have two little trees that stay in their rooms year round. I put them up a few years ago and they loved them so much that I never took them down! They decorate them throughout the year with different things and have little LED lights on them. We've never really done much in the way with outdoor lights but we always put up garland, window clings, and some other assorted Christmas decorations. I'd love to hear about your holiday decorating! Leave your thoughts in the comments or join the Holiday Hop in the linky below with your own posts - anyone is welcome to join in! I always like to wait until right after Thanksgiving to put up our tree, too. Although this year I'm planning to have everything else done before Thanksgiving so we'll just have the tree left to do. I love looking back at all of the ornaments we have collected over the years too. Such sweet memories.